February 5, 2019, marks the start of this Lunar New Year. A centuries old tradition, the Lunar New Year is celebrated in many countries across Asia and around the world. In Chinese culture, each year in the 12 year lunar cycle is represented by a different animal and – according to the Chinese zodiac – 2019 is the Year of the Pig. The pig is the last of the 12 animals in the Chinese zodiac, and is seen to represent fortune, honesty, happiness and virility. According to an ancient Chinese story, the Jade emperor decided the order of the animals according to how they placed in a Great Race. Just before the end of this race, a huge squeal came from the river. The pig had gotten hungry and stopped along the way for a little nap. The pig’s appetite had made him late, but he did arrive before the end of the competition. So, the pig became the 12th animal in the Chinese zodiac. 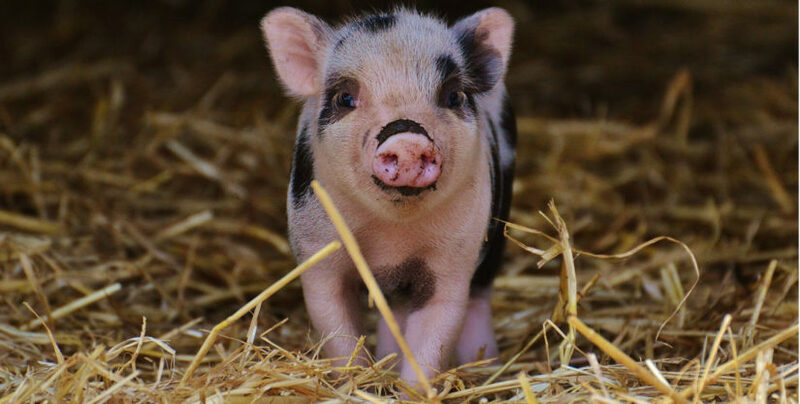 In celebration of this Year of the Pig, we’re sharing 10 reasons why we love pigs and why we think you should too! 1.) Scientists have determined that pigs are very smart animals. They are curious and insightful, and learn quickly. Not only are they smart – many tests have shown pigs to be smarter than dogs, some primates and even three-year-old children! 2.) Pigs are highly social animals. They form close bonds with people and other animals. They show affection by grooming each other and greet each other by touching noses. Pigs even hang out, sunbathe, and play together. At night, they sleep in groups, huddled together in warm nests. Piglets huddling together as they sleep. 3.) In nature, pigs are very peaceful animals and rarely show aggression. However, when they are kept in small, crowded spaces where they are unable to express their natural behaviours, pigs may get frustrated and bored. This can lead to stress and aggression, and aggressive pigs may chew on other pigs’ tails. 4.) Have you ever heard someone refer to a room or office as being a “pig sty”? Many people have a misconception that pigs are dirty animals, but the truth is, they are actually quite clean. In nature, they keep their toilet area far away from where they lie down and eat. However, pigs can get dirty if they are kept in small or crowded spaces (e.g. gestation stalls) since they can’t choose a separate place to go to the toilet. 5.) Content pigs often have curly tails, while stressed pigs straighten their tails and tuck them between their legs. 6.) Oink oink! Pigs love to talk. They communicate constantly with each other and have a vocabulary of over 20 different oinks, grunts, barks, squeaks and squeals. A lactating mother sow even has a special call to let her piglets know it’s time to eat. A mother pig wallowing in the mud on a hot day at Harley Farms. 7.) Have you ever seen someone “sweating like a pig”? Probably not! While humans sweat to keep cool, the truth is – pigs don’t really sweat. Instead, when pigs are warm they roll in “wallows” (shallow mud pits) to cool off. This mud coat also helps fend off biting insects and protect their skin from being sunburned. When pigs are cold, they huddle together to warm up. 8.) Pigs have a strong sense of smell, just like dogs! They use scents to identify one another, to find their way around, and find hidden food. They even use their strong snout to dig (called “rooting”) for food that is buried underground. A pig rooting in the pasture at Sumas Mountain Farms. 9.) Wild pigs play an important role in managing ecosystems and maintaining biodiversity. They make new places for plants to grow when they root in the soil and they spread plant seeds in their manure. 10.) Pigs are great mothers. In nature, a mother pig (called a “sow”) will search far and wide to find a safe place to build a nest for her unborn piglets. In fact, sometimes sows travel as far as six kilometres to find the perfect spot! When the sow gives birth (called “farrowing”), she develops strong bonds with her piglets and they stay together in the nest for about two weeks. After this, they all return to the herd where the sow then weans her piglets and teaches them how to survive. Are you passionate about farm animal issues? Use the form below to subscribe to our FarmSense e-newsletter. Four times per year you will receive news and information on what the BC SPCA is doing to help further farm animal welfare in Canada!